Awhile ago during finals week, a few friends and I decided to take a well deserved break to head out to George Washington National Forest to hike Big Schloss. The trail is located on the border of Virginia and West Virginia and is definitely one of my top three favorite hikes I’ve ever done. You start off at Wolf Gap Campground and start up the orange blazed trail. The first mile is a straight uphill with multiple switchbacks, but it pays off. After that first mile you come up to a ridge line which offers fantastic views before reaching the actual outlook. The trail along the ridge line is beautiful soft grass surrounding rocks. 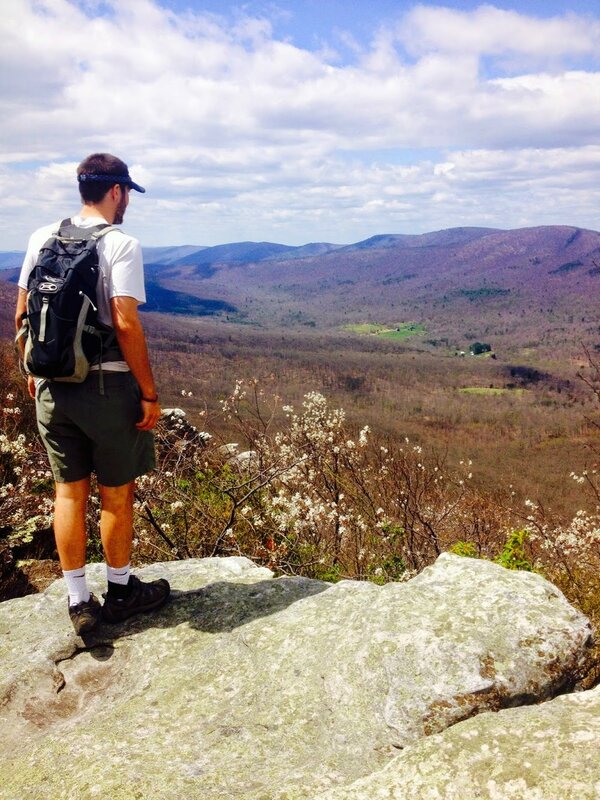 After hiking the ridge line for a little less than two miles you reach a wooden bridge that connects you to a huge outcrop of rocks that offers a 360˚ view of Virginia and West Virginia. There’s a little bit of a scramble to get to some parts on the outcrop of rocks. The day was super clear and we could see for miles in all directions. The only bummer was that the leaves still hadn’t come in on the trees so everything still looked dead. Otherwise it was perfect. We rested for a little bit on the rocks and enjoyed the (windy) view before retracing our steps and heading back down to the campsite. If you ever find yourself near Winchester VA or Front Royal VA, I highly recommend taking the time to stop and enjoy this beautiful hike.